So I did some experiments and built a prove of concept digital back for one of my sliding box cameras. It all seemed a bit big and clunky so I changed the design so that i could use the digital back on several of my 5x8 cameras. I have several 5x8s as that is my favourite format and one of the restrictions in sliding box cameras is that one camera cannot cater to a wide range of focal lengths. So I have one for wide angle, one for normal and one for long focal lengths. Nice work, Ray. An interesting concept which can produce pleasing images. I particularly like the first image; the enhanced light fall-off at the closer focusing distance really highlights the subject. I can see all sort of creative possibilities with this process, like separating the RBG channels and printing each in different gum layers... if you wanted to. Keep it up. Brilliant images, Ray, and I reckon there's a profound philosophical sub-plot involved too. I've always thought that the fundamental subject matter in photography is the real optical image in the back of the camera, not the illuminated stuff out in front of the lens. That's why a photograph of a tree (say) is not at all like a tree but rather bears a striking resemblance to an image of a tree. Curiously this (fundamental ?) real optical image can't be seen by just looking. Taking the back off a camera and placing the eye at the focal plane delivers nothing usefully visible. 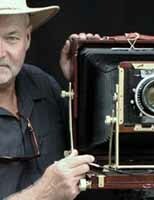 But put a ground glass there and the picture jumps into view with all its magic richness. Thanks Ray for this seriously clever and beautiful technique. Thank you Maris, great words that go someway to expressing my own feelings on images, photography and representation. A few more tests shots and then a quick drive to capture a few images in the late afternoon, yesterday. Great art Ray, they remind me of a Jim Galli's Eddie Lens on Tonopah pictures "'like an explosion in a mattress factory". I have got a similar effect (though a little more harsh) by taking a shot thru a Fresnel screen. I think Maris description covers it perfectly, quite a wordsmith!